I could feel the complete difference, when I was out on my bike by 11 PM. Says it all. No Hotels. Less Traffic. Empty Streets and Snores from inside the houses. Chennai is dead after 10.30 PM, except for Strong hearted people who still watch Sun TV Serials beyond that time. My office hours at Mumbai, made me witness the night life in Mumbai (Dont think of the Dance Bars.. now). I can simply walk out of my office at 1.30 midnight, and order Rotis and Sabjis in any of the Hotels Iam free to choose at that time. Other main differences - AUTOs and TAXIs. We can all build huge temples to these Auto Drivers and worship them. Frankly speaking, Chennai's Auto drivers are pathetic and sick. Roads : Mumbai roads are AWKWARD. If you are driving on a two-wheeler, you will never have a smooth ride. Roads are not even, and a few insane brick tiles on the road will keep you jumping on the fuel tank. Chennai periodically gets good roads. Smooth roads. Well, what if you rode a four wheeler instead of a two-wheeler.. Oh ! I didnt tell you about the traffic-jams. Traffic Jams are worse than Chennai, despite of wider roads and more Express ways. Of course, population is huge compared to Chennai. One thing is, they are used to traffic jams. I didnt see people frowinging, or putting their heads out of the car, and shouting at the driver on the front. FOOD : You guys would have known. Two Simple sentences. In Chennai, you will get AUTHENTIC North Indian Food and as well as AUTHENTIC South Indian Food. In Mumbai, very few places give Authentic North Indian Food. And South Indian food... chancey illa. Sambhar and Coffee likers will hate Mumbai from the bottom of the stomach. Life style : Amazing. It made me feel im from some broken nation. Richness and Poorness are punjent in Mumbai. Either they are filthy rich, or very poor. How many Honda CRVs did you see in Chennai ? That many, you will see in just 4 minutes on Wester Express Highway. Where does Mumbai people get money from ? Girls : Oh yeah ! One great thing about Mumbai.. Girls and their awesome sense of dressing. Its not that they look good, their sensible way of dressing makes them look great. There is a political statement that I'd like to make about Chennai girls here. But Im sure it will create some chaos (even with my tiny popularity on the blog). So, I will not tell. Just understand I have a potential political statement to make (Wow !Feels good). Overall, even when I rate things and valuate them, even though Mumbai takes more points - Iam a cruel Master... I flunk Mumbai and give distinction to Chennai, like as if the whole exam was unnecessary. I Love Madras. 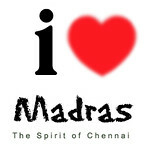 I blindly love Madras. Other main differences - AUTOs and TAXIs. We can all build huge temples to these Auto Drivers and worship them. Frankly speaking, Chennai's Auto drivers are pathetic and sick!! But if you stuck in traffic jam between Anderi to Ghatkopar then your gone. Did you check Matunga? or New Bombay for tam food? Authentic mallu food you can get easily in atleast half a dozen places. Almost 2 decades back (in the then Bombay), a taxi ride to go get South Indian groceries from Matunga used to be an exciting outing!! Anybody who goes to bed before mid-night are looked down upon there(Keerthi ungalukku seripatte varadhu!)! "Aye dil hai mushkil jeena yahan Zara hat ke zara bach ke, yeh hai Bombai meri jaan"
"dreeyonna dreeyo dreeyo dhunnunana nana..."
Between the hugely rich and the hugely poor you noticed, you missed to see the sea of middle class folks cramming Mumbai. And very few authentic North Indie places in Mumbai! You need to see Mumbai a bit more than a month. prabhu, i drive from my place to a Pizza joint in 2 Kms. I give the suto driver Rs. 10, and he gives me Re. 1 back. Oh No !! This cant be... I give Rs. 20 in chennai for the same distance. Hmmm..
thennavan, saw your post. As i told you, Chandivalli, Borevalli, Kandivali, Dombivalli etc are there. ttm, illappa. You ask any mumbai south indian. They know "Mani's Lunch home" in Matunga and 2 hotels close to it. Adhai thavira South Indian food is never authentic anywhere. aparna, aamam. Unfortunately my work hours are from afternoon 3 to morning. I get goosebumps on this song.. "Heeeeey ! Thandhana Thanandhana thannaa !! " guess what song it is.. (answer lies few post beneath). casement, about girls ? Chennai girls ? never. Good comparison though I have never been to Mumbai. btw, have you removed the Vaiko picture you had put in your blog earlier? yellam sollotu, Aanaalum kadaisilaaaa namma ora vittu kudikala.........anyway its jus 1 month illa! gladtomeetin, not just one month.. i'd been to mumbai long back..